Home » News » Bioenergy course modules available now! We are pleased to announce the publication of a collection of renewable energy resources is now available on the Centre’s website under the Education tab Online Bioenergy Course. The resources, including reference books, modules, exams and exercises, were crafted and used in our inaugural BIOENERGY course. The comprehensive course was offered in Belize by the Centre in cooperation with GIZ Renewable Energy and Energy Efficiency Technical Assistance (REETA) in August 2016 at no cost to participants. Since it was established in 2013, the REETA Project has been based in the CARICOM Energy Unit. The Project is being financed by the German technical agency, GIZ (Deutsche Gesellschaft für Internationale Zusammenarbeit GmbH). The project aims to strengthen the Energy Unit's coordinating capacity, and support the improvement of the general regional and political framework for renewable energies and energy efficiency. The programme supports the further development of technical institutes and promote their regional networking across the education sector, as well as, "sector-crossing" with industry. The iniative seeks to expand and provide trainings and continuing education in the field of renewable energy and energy efficiency at universities and technical institutions across the Caribbean. At the micro level, the program promotes model projects, including bioenergy with high visibility and replicability. The initiative contributes to securing the Caribbean's energy supply and stabilize energy costs. 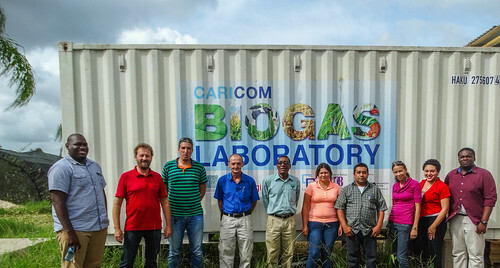 Bioenergy is one of the project’s main focuses and REETA has already financed a biogas laboratory in Belize, and further trainings ar eplanned to enable its sustainable usage and enhance knowledge about bioenergy. By caribbeanclimate in News on November 28, 2016 .